Getting a good WiFi signal in a marina or off shore can be challenge. Many things work against a WiFi signal from line-of-site to the atmospheric conditions. One day a signal may be found 10 miles out while others days a signal can’t be picked up a thousand feet away. One way to help get a better wireless signal on a boat is to get a better antenna or signal booster. Ideally both would be the best solution although depending on your current WiFi setup a better antenna may be all that is needed. A 2.4 GHz signal will travel farther than a 5.8 GHz signal. The 5 GHz range has been introduced to help relive the wireless congestion that is found in many cities. Shorter frequency wave lengths such a 2.4 GHz can travel farther and better though obstacles than a larger radio wave length. Even though 5 GHz routers along with 802.11ac protocol is being touted as the newest and fastest WiFi, using the old 2.4 GHz frequency is better for distance. If you have newer equipment than more than likely you have dual band router which can use the 2.4 GHz range or 5 GHz range. This would be the best option has you can quickly change between frequencies to find the one that works best. This will affect the type of antenna or WiFi booster that is used. The best option is to buy an antenna that work with both frequencies, 2.4 GHz and 5.8 GHz. 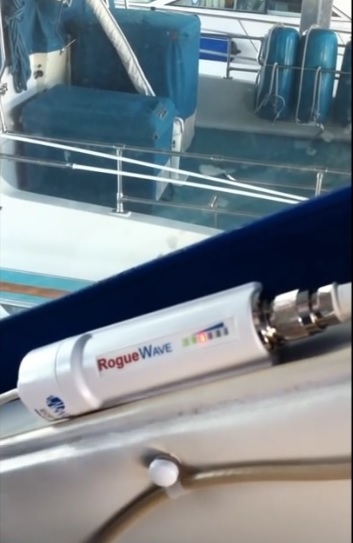 Rogue WAVE is a company that specializes in boating WiFi equipment and have multiple products for sale such as this signal booster/antenna system. This WiFi booster/antenna system from NautiCloud has some good reviews on the forums. This marine WiFi solution would be the ultimate setup that not only boost weak signals but can also be used as a access point. If this system is used be sure to password protect your WiFi as other boaters will no doubt try and connect to it. Pity you missed out on the system from Coastal Marine WiFi. Sure its based on the Ubiquiti Bullet like other systems, but the custom dual PoE not only provides 15vdc power to the Bullet, but also provides power to the supplied AP router that provides a hotspot on the boat. So just one connection to house batteries is required, simplifying installation. The Bullet is enclosed in a waterproof enclosure, avoiding potential issues in the connection to the antenna. And the Android/iOS apps make it so easy to scan for and select hotspots. You don’t have to be a techie to operate the system. A unique feature is that the apps adjust transmit power based on the strength of the remote hotspot signal strength, so when you;re close to a hotspot, the transmit power is reduced to avoid overwhelming the hotspot and prevents interfering with other WiFI users. Do you happen to know if using a Ubiquiti long range wifi antenna would work for accessing local hotspots? I’m not close enough to tap the city’s free wifi with just my computer, but my understanding is that if they’re not putting out a strong enough signal, I’ll be able to see it, possible able to use it, but very unhappy with the connection. Ummm … 2.4 Ghz wave lengths is not SHORTER than 5.x Ghz wave lengths … it is LONGER. 5.3 Ghz is about 2.2 inches wavelength. 2.4 Ghz is about 4.92 inches. I think you meant to say the Lower Frequencies travel farther and higher frequencies do not. Lower frequencies might penetrate barriers better than higher frequencies – but I wouldn’t bet on it at 2.4 Ghz. They went crazy over 700 Mhz for LTE because it could penetrate buildings and such better than the higher 800 / 900 / 1900 / 2100 Mhz frequencies … and those are the ones that they got in the FCC auctions due to the TV transition from Analog to Digital. Trying to boost wifi signal and capturing into the free hdtv free network available to offshore fishermen.